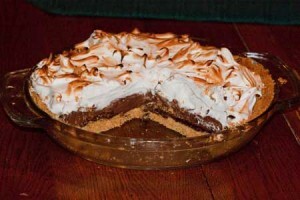 Chocolate pie with a graham cracker crust, chocolate filling and marshmallow topping. Preheat oven to 375ºF. Mix graham cracker crumbs, sugar and butter. Press mixture into a greased 9 inch glass deep dish pie plate and bake for about 7 minutes. Let cool. When cool, melt about 3 to 4 ounces of chocolate in the microwave using 50% power and stirring every 30 seconds. Brush over cooled crust. Let cool and set, then chill so that it's very cold (if it's cold, there's less chance of it melting if you put a slightly warm filling over it). Heat the milk in a large saucepan until very hot. Meanwhile, mix the sugar, cornstarch and salt in a large bowl, then whisk in the egg yolks and coffee Whisk half of the hot milk into the egg mixture until smooth, then gradually whisk the egg mixture into the pan with the remaining milk. Cook over medium heat, whisking constantly, until the mixture boils and thickens, 3 to 5 minutes. Remove from the heat and whisk in the chocolate until melted. Whisk in the vanilla. Transfer to a bowl and cool slightly, stirring a few times to prevent a skin from forming. I let it cool just to a point where I felt it wouldn't melt the shell of chocolate I'd brushed over the crust. Pour the filling into the crust; press plastic wrap directly onto the surface and chill until set. Make the marshmallow "ish" topping. Beat the three egg whites, cream of tartar and confectioners' sugar in a metal bowl set over (but not touching) simmering water with a mixer until the sugar dissolves. Remove from the heat and beat until stiff. Beat in the vanilla. Spread or drop in dollops across top of the pie and keep chilled until ready to serve. Before serving, grab a torch and torch the top.